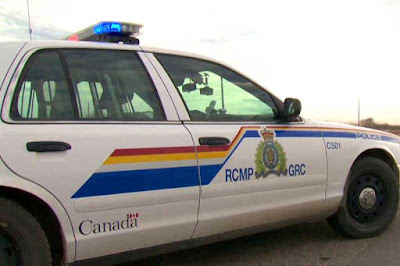 Police have arrested a 17-year-old from the Frog Lake First Nation in Alberta, Canada, after an altercation that involved three dogs, a sword, an all-terrain vehicle and a shotgun. Elk Point RCMP say a 35-year-old man was riding his an ATV on private property with his dog, when the animal got into a fight with two of the property owner's dogs. The rider drew a sword to defend his pooch after a teen arrived on the scene with a shotgun and shot him in the leg. The rider escaped the property and was treated by paramedics before he was airlifted to the University of Alberta Hospital with severe but non-life threatening injuries. Police arrested the youth and said he will answer to charges in St. Paul Provincial Court on Sept 1. Police did not say whether charges have already been laid, or what those charges may be. Frog Lake is about 250 km east of Edmonton. I didn't know Canadians would fire a gun at someone, even someone tresassing on their property and responsible for harming his dogs.